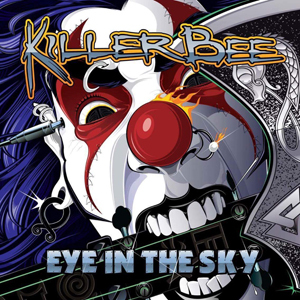 The first single and video "Get On Board" from Swedish hard rock band KILLER BEE's upcoming album Eye In The Sky has been released today. Watch the video for "Get On Board" on KNAC.COM right HERE. It’s been over two years since the last release and the wait has proven to be worth it. This new record it quintessential KILLER BEE. The writing team of Rönnblom/Frank has done it again. They deliver their 70´s style of Hard Rock with the precious and dynamics you expect from them. Eye In The Sky captures KILLER BEE at their best with an attitude that hits right between the eyes. Well known for their back to basics raw sound KILLER BEE have not swayed from their style. This new record has the hard and heavy riffs, the signature vocals and of course the classic hammond sound. All the elements that have set KILLER BEE apart from the newer hard rockers today. Since the early nineties the BEE´s have been delivering the sting. And now the hive has let the swarm loose. The last couple of years have not been without trials and tribulations though. Member changes, injuries and production hold-ups have made these years a roller coaster ride. The ride has taken them to a new level of energy. 2015 saw the band on an extensive US tour covering over 40 cities in no less than 35 states and the near future is only looking brighter. Radio programmers worldwide have begun to take notice as KILLER BEE are receiving positive responses to their music climbing on playlists everywhere. KILLER BEE are currently in planning stages for touring in both Europe and North America and have recently been confirmed for Denmark's finest rock festival Nordic Noise Rock Festival in May 2017 (www.nordicnoise.dk).